Nick Faust is beginning to advance his recruitment. He went on to add that Maryland, Marquette, Oregon State and Florida State are his main four, and have each set in-home visits. Faust said the main thing he is looking for in a school is his ability to contribute immediately when he gets on campus. “Just that I could come in as a freshman and make a big impact,” he said. 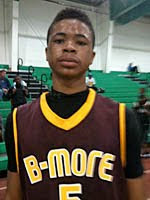 Interestingly enough, the only campus visit the 6-foot-4 guard from Baltimore City College (Md.) has set is not from one of his main four. “I visit Memphis Oct. 15, set date,” Faust said.